Regulators on Tuesday released a 60-page executive summary of the Desert Renewable Energy Conservation Plan at a North Palm Springs event headlined by Interior Secretary Sally Jewell and Sen. Barbara Boxer. CEERT has gathered together the media coverage we believe relevant to this important event. 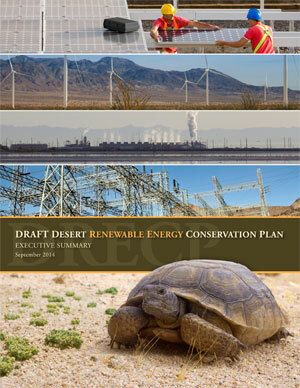 Read the 60-page executive summary of the Desert Renewable Energy Conservation Plan (PDF) by clicking here. For six years, state and federal officials have worked on a sweeping plan that would promote renewable energy development while protecting California’s pristine and largely undisturbed landscapes. But when the 8,000-page plan was finally released, its proposals prompted as much criticism as they did relief. Local conservation groups have blasted the Desert Renewable Energy Conservation Plan as the latest, greatest threat to California’s iconic deserts, arguing regulators are trying to open too much undisturbed land to development. And wind advocates, who might be expected to benefit from the plan, have said it is so restrictive that it will hinder their industry’s potential growth in California. A revised draft plan released this week by state and federal agencies to expedite and manage how large-scale solar and wind power projects are sited and permitted in California’s southeastern desert region is being closely scrutinized by a broad range of stakeholder groups, some of which may eventually legally challenge the plan, sources say. PALM SPRINGS, Calif. – U.S. Interior Secretary Sally Jewell joined local and federal leaders to tour different solar and wind energy facilities in the Coachella Valley Tuesday. She celebrated the desert’s efforts toward clean energy and unveiled the draft Desert Renewable Energy Conservation Plan. Industrial-scale solar, wind and geothermal projects could be built within a few miles of national parks in the California desert as part of the Obama and Brown administrations’ efforts to combat climate change, under a mammoth plan released by federal and state officials Tuesday. Construction of the plants, many of which could cover several square miles, would drastically alter desert vistas near national parks and wilderness areas, according to a draft of the Renewable Energy Conservation Plan, a joint state and federal project more than five years in the making. Secretary of the Interior says Desert Renewable Energy Conservation Plan will put solar and wind projects in place with minimal harm to wildlife, native artifacts. PALM SPRINGS – With giant windmills rotating behind her Tuesday, U.S. Interior Secretary Sally Jewell announced a sweeping land-use plan for energy development in California’s deserts that seemed more like a promise than a strategy. With towering white wind turbines turning slowly in the background, U.S. Interior Secretary Sally Jewell on Tuesday unveiled a plan to manage both conservation and renewable energy production on more than 22 million acres in California — nearly one-quarter of the state — as part of a federal and state effort to promote clean energy production. The Interior Department today released a sweeping draft plan to manage development of renewable energy projects across a vast swath of public and private lands in the Southern California desert to guide projected solar, wind and geothermal development over the next three decades that’s expected to power millions of homes and businesses. The draft Desert Renewable Energy Conservation Plan (DRECP) unveiled today by Interior Secretary Sally Jewell calls for establishing 2 million acres of “development focus areas” within a 22.5-million-acre planning area that are deemed suitable for commercial-scale renewables development or transmission-line projects. Proposed projects in these designated areas would still undergo environmental review, but the process would be streamlined because the areas have already been surveyed and studied, and mitigation requirements already established as part of the conservation plan. The draft plan also proposes adopting an overarching conservation strategy that calls for avoiding identified environmentally sensitive areas and outlines mitigation requirements for unavoidable impacts. Along those lines, the draft plan establishes conservation designations on 4.9 million acres of lands within the planning area managed by the Bureau of Land Management, and recreation designations on another 3.6 million acres of BLM lands. The agency would not accept renewable project applications on lands inside either of those designated areas, except for some geothermal activity in the recreation areas as long as there is no surface occupancy. BLM, the Fish and Wildlife Service, the California Energy Commission and the California Department of Fish and Wildlife developed the draft plan over a five-year period. To achieve the conservation goals outlined in the draft plan, BLM proposes to amend three land-use plans in the California desert region covering nearly 10 million acres. Among other things, these amendments could add 3.9 million acres to the existing National Landscape Conservation Lands system and designate 1.9 million acres as “areas of critical environmental concern” — all in an effort to protect 37 species that are “covered” under the DRECP, including the Mojave fringe-toed lizard, California condor, desert bighorn sheep and burrowing owl. BLM also proposes to manage 300,000 acres in the planning area that have been identified as having wilderness characteristics in ways that protect those characteristics, according to the draft DRECP. The draft plan and an accompanying draft environmental impact statement/environmental impact report consist of multiple volumes totaling more than 8,000 pages. They will be published in the Federal Register on Friday, kicking off a 106-day public comment period running through Jan. 9, 2015. BLM and state regulators are planning an information webinar to help the public navigate the volumes of documents, and federal and state regulators plan to hold a series of yet-to-be-scheduled public meetings in October and November. A final DRECP is not expected to be completed until 2016, said Dana Wilson, a BLM spokeswoman in Sacramento, Calif.
Jewell said today during a ceremony to unveil the draft plan in Palm Springs, Calif., that the DRECP marks a major milestone in renewable energy development by ensuring that projects will be sited in areas with relatively low natural resource values across the Mojave and Colorado deserts — an area where 17 renewable energy projects covering thousands of acres have already been approved by BLM since 2009. The draft DRECP conforms with the landscape-level mitigation strategy Jewell unveiled earlier this year that calls for developing “landscape-scale goals” on BLM, National Park Service and other federal lands that focus on balancing conservation and recreation with energy development (Greenwire, April 10). Jewell also said the draft proposal advances President Obama’s Climate Action Plan unveiled last year. That plan for combating climate change among other things challenged Interior to approve an additional 10,000 megawatts of renewable energy projects on public lands by 2020. “This is a major milestone, and I hope it is one of many that we can launch around the country. I hope we can get more across the finish line before the 2½ years are up that I’m in this job,” Jewell said today during an announcement ceremony that included California Sen. Barbara Boxer (D), California Reps. Grace Napolitano (D) and Raul Ruiz (D), and John Laird, secretary of the California Natural Resources Agency. The voluminous draft DRECP covers 22.5 million acres in seven Southern California counties — Imperial, Inyo, Kern, Los Angeles, Riverside, San Bernardino and San Diego. The county with the most acreage covered in the draft plan is San Bernardino County, with 11.9 million acres. The vast majority of the planning area — 17 million acres — is on federal lands, much of it managed by BLM, according to the draft DRECP. There are three main components of the conservation plan. The first are the BLM land-use plan amendments covering a 10-million-acre area that includes expanding National Landscape Conservation Lands in the region. The second covers the nearly 5.5 million acres of nonfederal lands, under what’s called a “General Conservation Plan,” that would allow the Fish and Wildlife Service to streamline the permitting process for incidental “take” permits involving endangered or threatened species for renewable energy or transmission projects as long as the project backers formally agree to the conditions outlined in the DRECP. The third component is what’s referred to in the draft plan as a “Natural Community Conservation Plan” covering the entire 22.5-million-acre planning area. It lays out an overarching strategy to protect and enhance the 37 species and their habitat covered in the draft plan. The draft DRECP assumes that 20,000 MW of new renewable energy will be developed in the planning area by 2040. Thus, the DRECP is designed to “direct future renewable energy development into areas where environmental impacts are expected to be less severe and where transmission access can be more easily provided. This will have the effect of conserving sensitive desert species and ecosystems while reducing permitting uncertainties,” according to the draft DRECP’s executive summary. With each approved renewable energy development or transmission-line project, there will be “measures designed to avoid or minimize impacts” to any of the 37 covered species, according to the summary. The draft DRECP considered five additional alternatives, including one that confined renewable energy development “to low conflict disturbed lands,” the executive summary states. Numerous conservation groups have called on BLM and the state of California to focus commercial-scale renewable energy projects on already disturbed lands. The draft DRECP dovetails with the massive Western Solar Plan approved in late 2012 that established 17 solar energy zones in six Southwestern states covering about 285,000 acres where permitting for commercial-scale renewables projects is streamlined. Companies that develop projects within these zones, where solar resources have been determined to be high and potential environmental conflicts low, will benefit from financial incentives, lower planning costs and faster permitting. Former Interior Secretary Ken Salazar in 2012 signed a record of decision finalizing the 17 solar energy zones, which if completely built out would facilitate up to 23,700 MW of solar energy, or enough to power 7 million homes (E&ENews PM, Oct. 12, 2012). That plan established two solar energy zones in California. It also identified an additional 19 million acres of “variance” lands that needed more study before renewable development could occur. The draft DRECP incorporates about 183,000 acres of variance lands requiring additional study. The draft plan would also appoint a DRECP Coordination Group that would oversee implementation of the conservation plan among the various federal and state agencies, including monitoring compliance and securing funding for monitoring. Click here to read more about the draft plan and to review documents as they become available. This entry was posted in Blog and tagged Desert Renewable Energy Conservation Plan, DRECP. Bookmark the permalink.